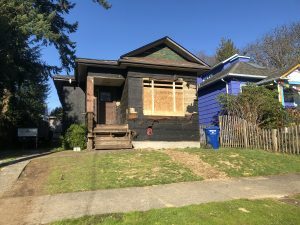 This is the first installment about my latest project: the ‘Sixty-fourth Street Bungalow – Flip’ a studs-out remodel of a classic 1906 Ballard home just begging for a new owner. The property was purchased off-market from a property owner whose family had it for the 40 years and which hadn’t been lived in for over 3. 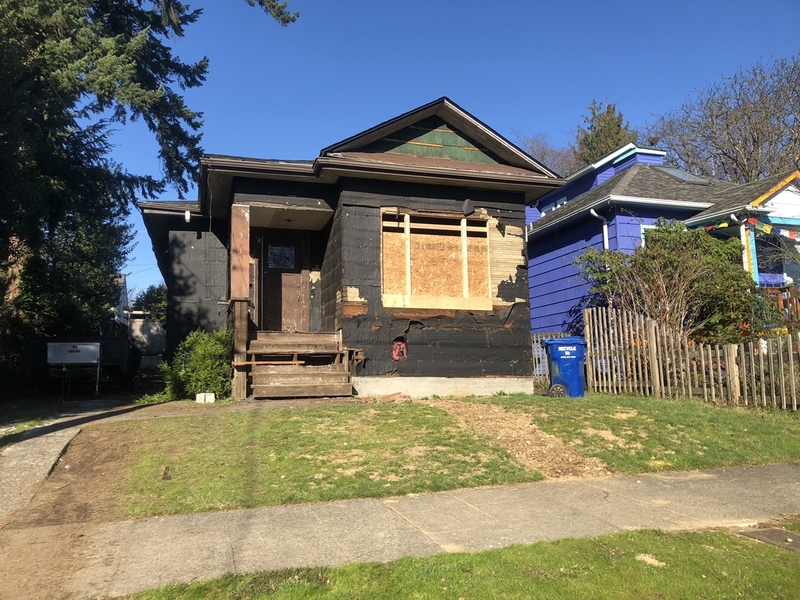 Covered in a tattered leaking blue tarp, no heat, and filled with 40 years of memories, a situation where the current owner had not been able to let go of her family’s home, until now. The timing was perfect and she was getting ready to consider listing the home for sale. We purchased the home as-is for a fair price and she was able to move on, knowing that we were going to focus on rebuilding it and not tearing it down to build a new modern home. At just 950 sf, with 2 bedrooms, 1 bath, this single story home with a partial unfinished basement had he right bones to transform it into a great home that lives the way we expect homes to work today, but with the historic feel. Its now on its way to becoming a 3 bed 2.75 bath 1,290 sf “ home with all new systems, and a bathroom for every bedroom, something that allows it flexibility for a variety of buyers: singles who are looking for an investment, couples looking to grow into their home and have it flex with them, or even small families ready to live the single family Ballard lifestyle, as a turn key purchase, and no pending capital repairs for the foreseeable future. 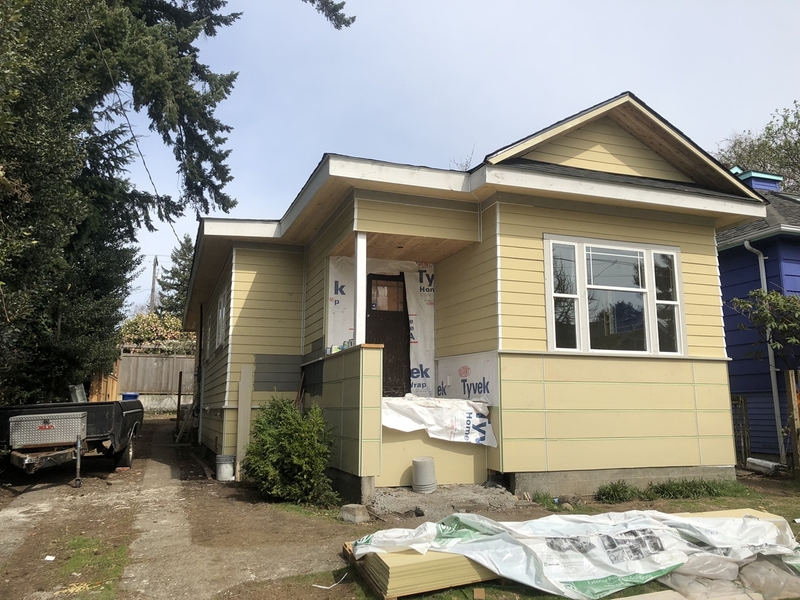 Except for the framing and the foundation, the home is basically new, preserves the character of the neighborhood, and affords a flexible small home with a yard that is a coveted commodity in Seattle. The alternative is a stand-alone new construction townhome, with a roof top deck and little or no yard on a 1000 sf lot. should be around for another 100+ years. I have been flipping houses since 2010 for real estate clients, investors and for an investment fund. All of these clients have different characters, styles and idiosyncrasies, but regardless, the goal remains the same: profit from ‘fixing problems’ and bring out the best in a piece of real estate through value-add changes, as fast as you can, in a market where there is “velocity” or pent-up demand. You really must hit on all these elements to be successful. If it sounds dry, crass, profit minded, boring, it can be, but the fun is in realizing the goal and staying disciplined while being creative along the way. Like an outdoor adventure, there are weather, unknown conditions, endless decisions and, cash flow challenges to deal with along the way, any of which can kill a great project.